The liturgical moment concerns the examination of the tragic and triumphant experiences of the African Family in the context of North America and the larger economy of God. The themes of love, honoring our elders, and celebrating the many forms of family, whether grandparents raising young children, single parents, adoptive parents, and extended family networks are all brought to the fore on this day. This celebration also engages the shadow of slavery, displacement and disruption of family, caused by the trans-Atlantic slave trade. The essence of the African American experience is framed by the unique dance performed by black families between the existential “Blues sensibilities” of pain and eschatological Gospel inspired joy demonstrated by our faith community. Any prophetic interpreter must courageously walk the road of tragedy while maintaining a rhythm of triumph. The family, arguably the greatest psychosocial organism humanity has birthed into existence, is shaded by a “Blues sensibility” when viewed from the balcony of Black history. Toni Morrison, one of our greatest living writers, eloquently shares the dilemma of the Black family in the novel, Beloved. The protagonist, Setha, is haunted by slavery, family disruption and bruised spirituality. The voice of her dead daughter, “Beloved,” rises from the grave and speaks with an inescapable history of tragedy. The decisions of Setha haunt her throughout the novel, and the cruel lie of democracy greets her daily in her alleged “free” Northern life. Yet, she attempts to build a family in the midst of her tragedy. 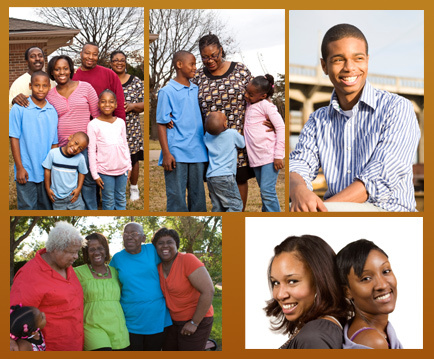 This simple yet profound ideal is the central value shared by the African American family. How do we live with tragedy, yet not fall into despair? Countless examples in every congregation reveal people struggling with the apparition of “Beloved” and the hope exemplified by Setha’s determination. All families are haunted; yet, God’s grace allows many to exorcise their demons or, at the very least, confront their ghosts. The central concern of this passage can be framed from the underside. An examination of economic, social and cultural factors will help nuance the text from the vantage point of the disinherited. This overall framing helps the preacher avoid a typical orthodox view of scripture and forces the reader to hear the text with multiple voices. Israel has moved from a landless, nomadic, former enslaved people to a community of “landed,” empowered, and budding military power. The people of Israel are no longer looked upon by the surrounding communities as insignificant, but they are now perceived as a military threat and a growing economic force able to use modern forms of metallurgy for imperial purposes. Abraham is rooted as the archetype of the promise within the Hebraic cannon, while Joshua is structured as the prototype of “fulfillment.” When the text is examined from the underside, we see the challenges facing Israel and the purveyor of this word. A Black family struggling to survive in a “pre-fulfillment age” or “pre-promise land era” is deeply connected to traditions, values, songs, language, stories and music produced during pre and post emancipation just as the Hebrew community was deeply tied to the pre-Jordan crossing narrative. The ethos of this “pre-fulfillment” is interwoven with the apparition (or ghosts) of slavery, subjugation and sorrow. Toni Morrison, as I mentioned earlier, brilliantly demonstrates the dichotomy of slave and free or promise and subjugation all displaced communities struggle to understand. The landless people of Zion and the homeless people of Africa speak of the God who kept them during these dark times. God is embodied in the Old Testament narrative in Theo-ecological encounters with the Israelites. The parting of the water, the encounter on a mountain and the crossing of the Jordan speak to the ecological framing this text. Joshua is a military leader of a former nomadic/rural people on the verge of becoming a military power. Joshua is speaking to those scared of these memories, these are they who want to live in the promise land, but do not want to throw away the landless/nomadic narrative. The retelling of the historical refrain, “I am the God who brought you out of Egypt,” is the chant of the ancient writers. Joshua is written in the shadow of this historical refrain. Examining the text from the underside again allows the preacher to connect with the post-modern issues facing the African American family. The narrative of the black family is rooted in the story of a landless/nomadic people, forced to find strength, not in the land of North America, but in the stories, songs, and traditions passed down from the antebellum South. The songs, rituals and cultural narratives are the/our land! They embody the promise and covenant between God and people. The encounter with God is canonized by African American culture and the church is the conduit to access this vast theological hard drive. The entire liturgical framing of the Black church is shaped by the ethos of a landless/nomadic people who reinterpret cultural and biblical texts to access God from the underside. Joshua’s covenant at Shechem is a speech only a privileged military leader who has lived on both sides of the Jordan could present. Choice is only offered to the privileged, the landed and the economically empowered. Choice is given to those who have options. Joshua gives the people a choice, an unlikely approach never offered by Moses, Joseph or Jacob. When connecting this to the challenge of families who are post-modern, one simply has to make the connection to the choices families of today are given versus families of yesterday. The choice to serve God, worship and go to church are the choices offered to the privileged, “post-fulfillment” and “post-promise” people. Joshua makes a radical and simple claim in verse 15. He states, “But as for me and my household, we will serve the LORD!” Joshua chooses to align his family with the landless/nomadic values of Abraham and Moses. He dares to defy the conventional wisdom of Mesopotamian religion. His family will not serve the land-centered, season-based gods of Mesopotamia, but create a new narrative where people of the land are shaped by the landless/nomadic narrative of their ancestors. “As for me and my household, we will serve the LORD.” “As for me and my household, we will celebrate our history and tragedy, but our history is more than tragedy, because God’s fingerprints are left upon the pages of our story.” Our story and Hebraic history are both living documents of God’s intervention. “As for me and my household, As for me and my household, As for me and my household we shall reclaim our values.” We shall reclaim the value of fellowship as a family, through dinners, household chores, and rituals. Our community can reclaim rituals of fellowship, storytelling and service to the wider community and humanity. “As for me and my house…” we will serve, pray, love, forgive, study, tithe, and more. Colors: The color of the fertile land given to the Israelites, and the colors of family items in households. Brueggemann, Walter. The Land: Place As Gift, Promise, and Challenge in Biblical Faith. Overtures to biblical theology. Minneapolis, MN: Fortress Press, 2002. Morrison, Toni. Beloved: A Novel. New York, NY: Knopf, 1987. Billingsley, Andrew. Climbing Jacob's Ladder: The Enduring Legacy of African-American Families. New York, NY: Simon & Schuster, 1992.